Over the years I have seen plenty of picture books based around animals, what they are, where they come from etc. However I don't recall any stories specifically based on fish, to be more specific, fish migration. 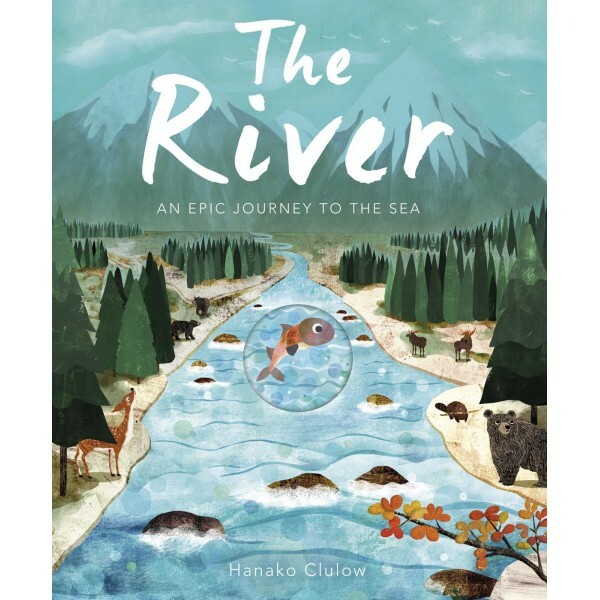 Patricia Hegarty seems to have spotted this gap in the market and along with illustrator Hanako Clulow, they have created a tale all about one fish on what can only be described as an epic journey as she travels down the river. The River is actually quite a simple book but I think that is what makes it so effective. It begins in those snowy mountains and we see through a peep hole a small fish lurking in the water. What caught my attention immediately was the pictures themselves. The colours aren't too bright and there isn't too much going on, this gives the reader a chance to enjoy what's on the page. We get an idea as to what animals live in colder conditions and this opens up the discussion as to what other animals you might find in the snow. Something that I know will please a lot of children is the hint of glitter on the little fish. It adds a touch of sparkle and I believe makes the fish stand out and being the main focus of the story I can see just why this has been done. Lets be honest who doesn't love a bit of shimmer and shine, that extra attention to detail makes the book magical somehow. The first thing my 5 year old wanted to do was stroke the fish, so it actually gave it an interactive quality. With each page turned you get to go along with the fish for each stage of her trip as she swims through varying climates. And with each image comes new animals to discover and learn about, from deers to beavers, from owls to geese. There is a lovely variety with each scene of nature that we are introduced to and what makes this book more unique is that it's not just the typical animals that you tend to find in a lot of picture books these days. Through different weathers, night and day, this tiny fish carries on travelling regardless and with simple rhyming text add to the beautiful illustrations her journey is bought to life. And of course we aren't just learning about the fish, we're also getting the chance to gain knowledge on the river itself. Rapids running fast and slow, the effects that light and dark have on its appearance and then of course the fact that a river can change into something bigger, a sea or even an ocean. There is a real gentleness to the tale, you get a sense of tranquility and quiet magic as you turn the pages. The River enables little ones to begin exploring nature from the safety of their home, pulling them in and creating scenes that are wonderfully entrancing, where will the fish move to next. It makes you feel as though you could be swimming down river too, it is the sort of journey pefect for young children to embark on. This sounds like a lovely story and also a nice way to learn. I'm sure my niece and nephew would enjoy it.